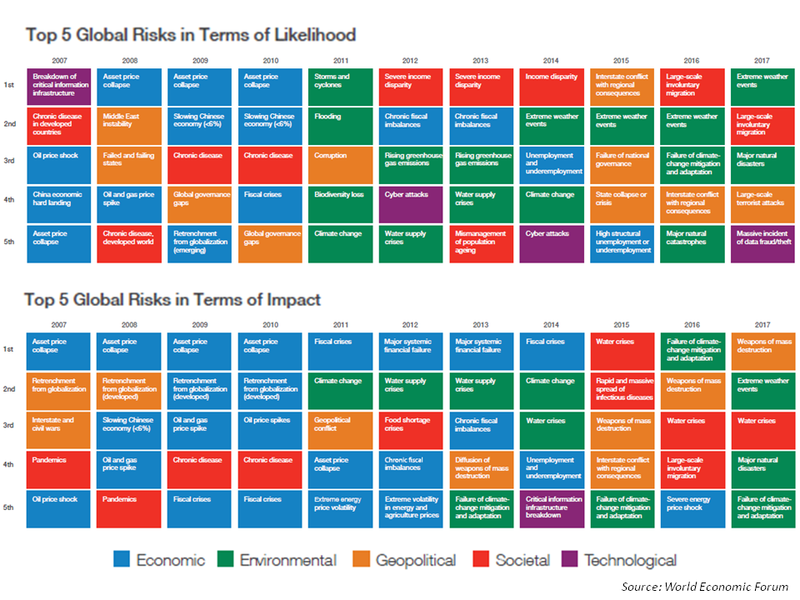 The latest World Economic Forum report on global risks is out today and, as usual, it reflects current concerns rather than offering any predictions for 2017. To be fair to WEF, the top risk for 2012 to 2014 inclusive in their survey was income disparity which is commonly viewed as one of the factors behind the rise in populism. The report states the obvious about the impact on global risks following 2016, specifically that “societal polarization, income inequality and the inward orientation of countries are spilling over into real-world politics” and that “decision-making is increasingly influenced by emotions” due to the increase in nationalism. 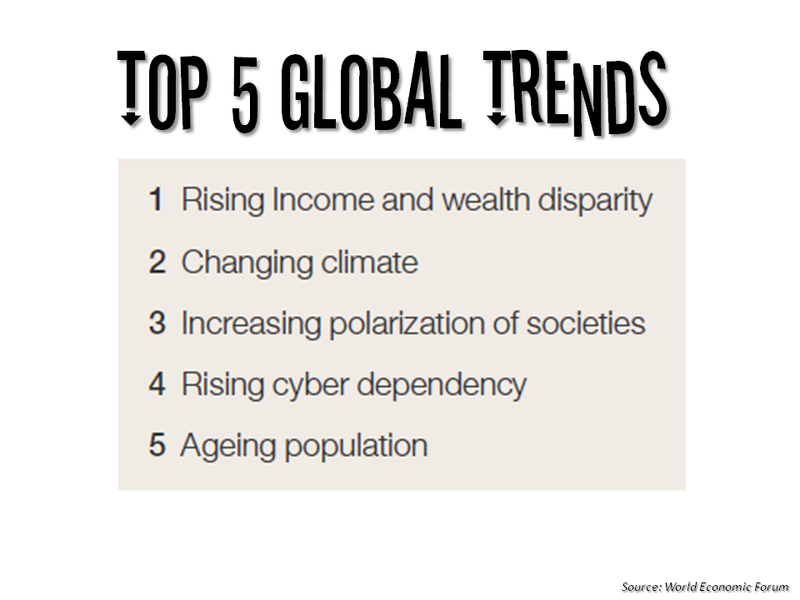 Where this year’s report is spot on, in my view, is in relation to the top 5 global trends that will determine global developments over the next 10 years, as below. The report also states that “although anti-establishment politics tends to blame globalization for deteriorating domestic job prospects, evidence suggests that managing technological change is a more important challenge for labour markets” and that “we are in a highly disruptive phase of technological development, at a time of rising challenges to social cohesion and policy-makers’ legitimacy”. Among the many risks highlighted in the report is a reduction in geopolitical co-operation which is likely to be detrimental to global growth, action on global indebtedness, and climate change. It’s particularly depressing to think that even if the commitments under the Paris agreement were delivered, which now looks doomed after the election of Trump, the United Nations Environment Programme (UNEP) estimates the world will still warm by 3.0°C to 3.2°C, still far above the 2°C limit where scary and irreversible stuff happens. Another worrying risk is the possibility of a new arms race in an era of rapid advancements in a technology which also has a retrograde feel, especially “while risks intersect and technologies develop quickly, too often our institutions for governing international security remain reactive and slow-moving”. All pretty cheery stuff! And on it goes. As I write this, I’m watching reports on Mr Trump’s press conference today, and although there is no doubt that our world is riskier as we enter 2017, it will be entertaining to see this guy as the leader of the free world. Hopefully good entertaining, not depressing entertaining! This entry was posted in Climate Change, General and tagged 5th IPCC assessment report, Chinese economy, climate action plans, climate change, cyber crime, cyber risk, cyber terrorism, disruptive technology, economic slowdown, extreme weather, geopolitical cooperation, global emissions, global risks, global trends, globalization, income inequality, indebtedness, international security, nationalism, Paris Agreement, Risky World, social cohesion, social unrest, societal polarization, technological change, UNEP, United Nations Environment Programme, water supply issues, World Economic Forum. Bookmark the permalink.